Product #15563 | SKU LCT 840 | 0.0 (no ratings yet) Thanks for your rating! 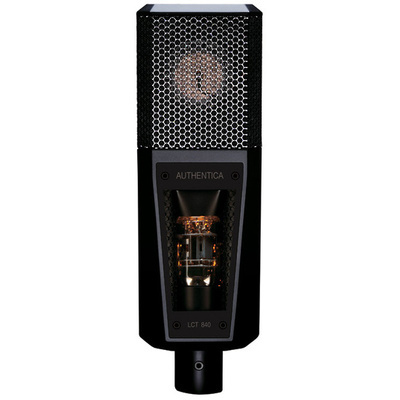 Lewitt's LCT 840 is a premium-class externally polarized dual-diaphragm tube microphone designed to excel in a variety of demanding applications. Equipped with a precision-engineered 1-inch capsule, the LCT 840 stands for exceptionally warm and classic, solid vintage sound. Perfectly suited for miking vocals and instruments, this rugged multi-purpose microphone allows for highly nuanced and authentic sound reproduction in the studio and even on stage. Five switchable polar patterns – omni-directional, cardioid, figure-8, wide-cardioid and super-cardioid – make the LCT 840 a highly versatile tool for professional audio engineers and performers looking for true and authentic tube sound. Like all Lewitt mics, the LCT 840 stands out for its extremely low self-noise of 9 dB and effective rejection of off-axis sounds. The microphone features three levels of attenuation and three switchable high-pass filters, LEDs and pushbuttons for noiseless handling on the power supply unit (PSU). Apart from user-friendly operating controls and advanced technological features so essential to memorable recordings, the LCT 840 also makes an eye-catching design statement: The microphone is equipped with a plexiglass inspection window on the front side of the body, so the illuminated tube itself is fully exposed. The inside window surface is coated with a highly conductive, yet transparent film preventing electromagnetic interference. In short: The unique combination of innovative design, high-end technology and tube-typical sound quality ensures magic takes.